The first thing I learned when starting this game was that there’s a lot more to the Buck Rogers franchise than simply the old Universal serials. Buck’s got a long legacy of comics, radio, and TV programs, and none of them seem to be all that connected. 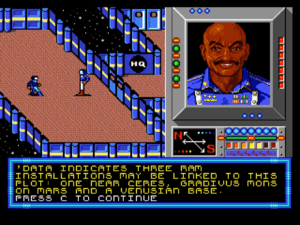 In particular, this game is based off TSR’s pen-and-paper RPG series, which finds the New Earth Organization fighting the oppressive Russo-American Mercantile in the 25th Century. You also will not be playing as Capt. Rogers himself, but given how you can mold your team into an impressive galactic force, that might actually be for the best. Boss man here has a whole host of missions for your team of space cowboys. Countdown to Doomsday is a classic SSI “Gold Box” RPG on the computers, and I was specifically asked how this console port compares. Best I can tell, none of the plot changes. Some elements are simplified. There are only three races and four classes (as opposed to six races and five classes on computers). The area you can travel to is smaller, ending around Mars here while the computer versions extend past Jupiter. Skills and weapons are pared down significantly, so the various versions of manipulative actions or craft you can pilot are now handled by simple “pilot” and “charisma” skills. You lose depth, but this doesn’t feel like a real setback when playing. In fact, I quite like most of what they’ve done here. I don’t particularly want to ration out skill points to the various parts of my ship I can fix, when the simple “rocket repair” skill works just fine. You begin by creating six characters for your party. There are four class choices here – Warrior, Rogue, Medic, and Rocket Jock – and you’ll want to have at least one of each. Classes are most distinguished by their special ability; only Rogues can bypass security, only Medics can heal the team after battle, and only Warriors can improve their skills with weapons. Another set of globally-available skills can delineate the classes even further, so you can have two Warriors that specialize in ranged or melee attacks, or one Rocket Jock that focuses on repairing the ship and another that can fast talk your way out of trouble. Then there are three race choices for each character. Humans are the average jack-of-all-trades. The Desert Runners and the Tinkers have vastly improved stat caps in certain areas, but are limited in their class choices. Ideally, you’ll match up the race with the right class to pull the maximum bonus (like a Tinker Medic). There are also six character stats that influence your success with the various skills. These values are determined by random roll at the character creation page, and the game will allow you to spend far too much time re-rolling those stats until you come up with some legendary space supermen. You can also skip all this and go with a default party that’s less specialized, but very balanced. 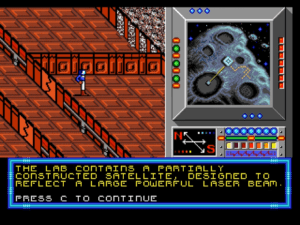 Party built, you begin your game at a moon base under RAM attack. After getting a feel for combat, skill usage, and successfully driving off the invaders, you’re conscripted into the service of NEO, operating out of the Earth starbase Salvation III. Here, you will check in and receive missions from NEO command that span the inner solar system. You’ll investigate derelict freighters, free Lowlanders on the surface of Venus, rescue children from an overrun research base, fight RAM’s mutated “gennies” and their corresponding research programs, and overall, try to stop RAM’s mysterious Doomsday Device from coming online. To this end, you’re granted a ship and the freedom to travel where you please between missions. Planets and starbases throughout the solar system offer stores with different supplies, medical services, and bars where you can overhear useful information or get into drunken brawls. Optional side missions can also be discovered for more XP and more tasty plot. You can also run afoul of pirates or RAM scouts out in space, with the option to engage these ships or attempt to sneak by. Your party’s overall stealth value determines if you slip away successfully, while battles bring you into a turn-based ship combat window. In ship combat, you can elect to reduce or increase distance (for offense or defense). Certain weapons also have minimum ranges before they can be fired. Both you and your enemy can target the opponent’s ship components, potentially shutting down weapons or engines. Your Rocket Jock’s “Jury Rig” skill allows you to make repairs between turns, hopefully letting you patch up critical systems long enough to fire off another volley. There’s also an option to board the enemy ship and take the engagement into the ground combat system. You’re almost always outnumbered though, even if you’ve softened them up a bit with some torpedoes, so boarding is rarely the safest option. However, if you can find and control the bridge, the loot you get is appropriately substantial. Ground combat is a frantic mix of flying laser beams and invisible die rolls. Ground combat is similarly turn-based. You view the proceedings from an isometric angle and position your team along a grid. Attacking, using special abilities, or moving to new grid space takes up action points. Fairly standard party RPG gameplay. Specific to this particular game is a consideration for zero-gravity combat. You won’t see any visual changes, but zero-g areas include a character’s “zero-g combat” skill into the equation. If your character’s skill is low, they suffer movement and accuracy penalties. There’s also stronger focus on ranged combat here, with a spread of various sci-fi guns. Most of your combat will consist of trading laser fire down short hallways, or trying to blast down gennies before they can close the distance and get their claws on you. If you feel combat drags along, you have a “quick combat” option per each party member. Selecting this turns that character over the AI until combat is done. You can activate this mode for every member of your party, and they’ll do a pretty reasonable job – using grenades when they have them, healing or reviving fallen comrades, and moving into position to attack. They’re not so hot at defense though, so the guy with the power sword better have the best armor you can find, because he’ll only charge and slash. Enemy AI is also singularly focused on attack, though their stats are generally shifted to support this tactic more than your characters are (read: huge life bars). They also tend to overuse grenades, but smart positioning (and gear found later on) help remove this advantage. While the computer versions use a first-person interface, ground navigation here uses the same isometric view. You’ll march a generic spaceman around the maps, which are divided into obvious rooms with sealed doors. This makes the layout clearly apparent, but it also lacks any detail. 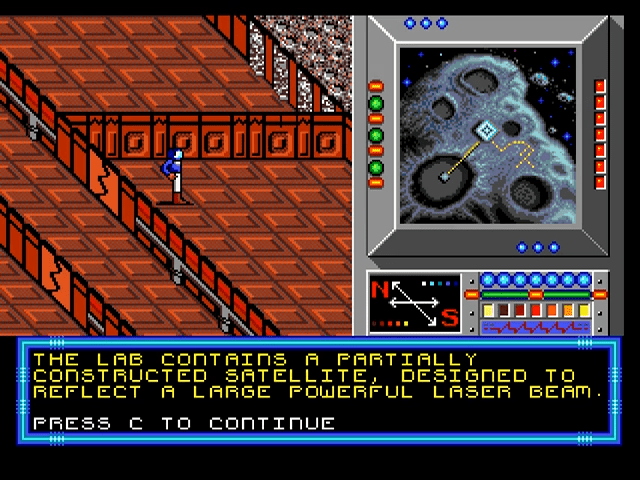 With the exception of mission-critical consoles, rooms are completely barren and feature the same tiled texture as the rest of the level. You’ll find no boxes, equipment, and even plot-related items won’t show up visually. It’s up to the text window to add any decoration, which is actually done quite well. Descriptions run in a window along the bottom of the screen, and though I can’t tell if they’ve been shortened for this port, they’re plenty verbose and easily guide your imagination. It also means you’ll need to pop your head into every room to know if there’s anything useful inside. Yes, you can’t see it. But your imagination has infinity-bit graphics. A wide variety of missions helps keep things interesting, and gives you some excellent RPG choices to weigh. Will you spare this group of gennies, or trust your gut that they’ll break their word? Will you help a man’s family even though it puts your mission in jeopardy? An early mission has you trapped with members of your party mysteriously falling ill and passing out. You have to frantically rush through an unexplored derelict to find a cure before you lose your entire team, and if you missed certain clues, can absolutely fail dramatically. There are also options that open based on the skill levels of your characters, so skilled Rogues can hack computers instead of sounding alarms, or Warriors can befriend aliens that help you in combat if your Leadership is high enough. It’s worth noting though, like any good RPG, there are quite a few “gotcha” choices that can essentially ruin your game. In an early one, you’re supposed to surrender to a pirate. This runs counter to your natural instinct, but fighting him puts you in a nightmare battle against multiple waves of expert troops you’re not expected to survive. It’s excellent in that it forces you to actually make tough, uncertain decisions – simply taking the moral path will not always reward you. It’s annoying in the sense that members of your party can actually die if they stay unconcious for too long, and there doesn’t appear to be a way to revive or replace them. Luckily, the cart gives you three save slots to work with, but it’s up to you to remember to manage them. Graphically, as said, the canvas is limited. The only downside is a possibility to get lost in the larger complexes, as the featureless corridors offer almost no landmarks. 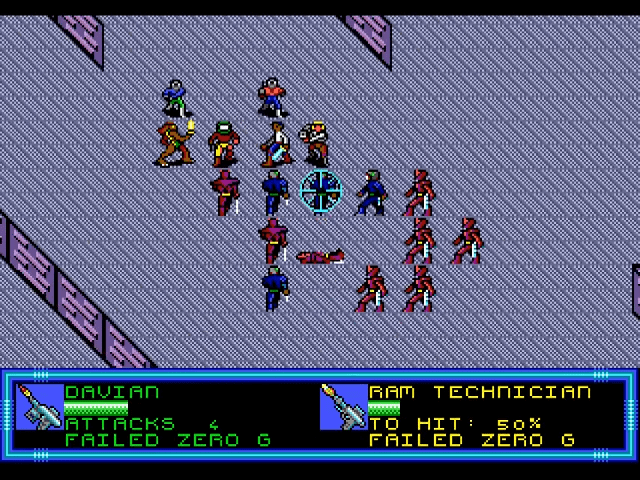 You also might have some trouble identifying enemy types by their tiny, low-detail representations, but clear text on the combat menus can take care of that. Another potentially low point is with the limited music. There are only a few themes, and they play constantly. You can shut them off and proceed with only the sound effects, but then are left with a pretty barren soundscape for most of the game. Pack your own music. I’m interested now to play the original computer version and see which one handles better, but either way, this is a perfectly playable port. I like the isometric navigation over the Gold Box first person view, I love the tactical feeling of the ship battles, and there’s some tremendous stories here worthy of the series’ high adventure serials. It’s slow-burning and lengthy – an RPG through and through – and getting killed for making a wrong choice will surely rub some players the wrong way. But if you’re prepared, it’s the full experience on the smaller console. Excellent set of contained sci-fi stories. Great party mechanics offer satisfying growth over the course of the game. Some pretty tough decisions to make. Nice variety of ship and ground exploration and combat. Keep your saves updated, because disaster can and will strike. Even less detail than the computer versions make ground areas that aren’t much to look at. Music isn’t great. Thanks, that was very brave of you to take it on, although you said “no RPGs”. Glad to read that it turned out to be entertaining. A smaller scale and fewer details/choices in character classes and skills might actually be seen as an advantage. I’m not really into RPGs, either, simply because many of them offer too much choice which turns out to be of too little consequence. I hate being forced to make some choice early on (read: party generation) which usually means leaving some of the options out completely without the slightest clue what the gameplay constraints resulting from that will be. At the beginning of a game, I can’t make an informed decision. RPGs usually punish this quite severely, because you have to play hours and hours before your wrong choices will become apparent. With fewer choices, chances are better than I might have almost everything available (even if that might also not be ideal). So, lightweight is good! I actually do enjoy RPGs – I don’t want to set the wrong expectation – it’s just the time commitment that terrifies me. Especially when a stated goal of the site is to finish everything before writing about it. So my only quarrel with RPGs is that they demand far more than their fair share of my often limited time. At least that’s the perception anyway. It usually works out once I get into them. Have to agree that RPGs are notorious for forcing long-range decisions on you at the start. Yes, I understand what the “Library” skill does, but I have no concept of how useful it is across the game’s duration. So now I’ve dumped points into a skill that gets called upon only a handful of times, when I clearly could have better spent those points in Zero-G Combat. Magnify these weaknesses enough, and it’s often time to start thinking about restarting the game with a revised party. Though at the same time, I’m not sure how I feel about the modern convenience of the “respec.” Seems to take some of the consequence and excitement out of the game. I will say this for early RPGs, they were dedicated to making those consequences and choices as “real” as possible, and tried to make that part of the overall fun. Have you played the Gold Box version? Any insight into how it compares? – Regular, non-combat movement is shown in a three-dimensional perspective. So a scene like the one on the last screenshot would not happen like this in that version. 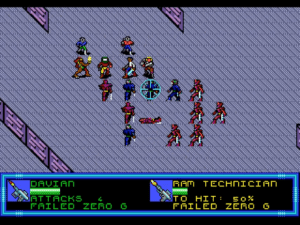 The isometric perspective is only used in combat. 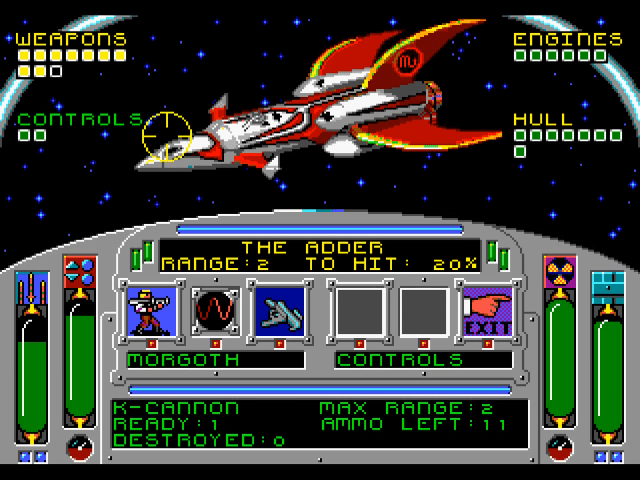 – This extra screenshot you have (http://justgamesretro.com/wp-content/uploads/2012/09/buckrodgen3.png) seems to imply there are Wing Commander like space battles. 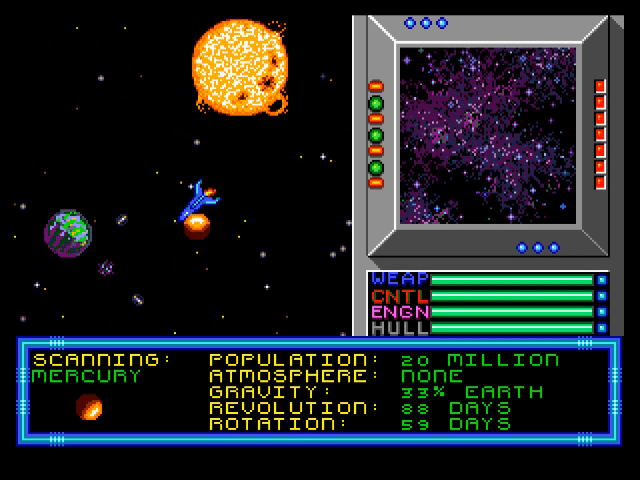 I remember the game having space battles, but they were turn based (?). I appreciated the science fiction setting quite a bit as I was very fed up with those typical D&D fantasy elements at that time. I remember the game being very hard, though. That, and the constant disk swapping of the Amiga version (the game did not recognise a second disk drive) prevented me from getting very far. Yes, that looks much more like I remember 🙂 With the crosshairs on your screenshot, I got a different impression. I should add that I don’t have the same dilemma in strategic or tactical wargames usually. The reason being that the development there happens exactly the other way around: You slowly build up your army as the game progresses, so you already have some idea of what works in what ways – and you can easily try all things out in the process to see what suits your playing style best. RPGs simply have this backwards.